Purpose – The purpose of this paper is to promote narrative inquiry as a legitimate and rich research approach for academics undertaking postgraduate studies in higher education learning and teaching. Design/methodology/approach – This paper is framed within a personal narrative – one that draws upon the author's personal experience as an academic developer. It draws heavily on narrative theory to support its claims. Findings – It is argued that when narrative inquiry is presented as a complement to, rather than a replacement for, other research approaches, uptake amongst diverse groups of academics is strong. Furthermore, it is suggested that when accompanied by personal engagement with narrative inquiry and presented within a theoretical framework that honours its history, its robust literature and highlights its fundamental purpose and unique qualities, the possibilities offered by narrative are more likely to be understood and embraced. Research limitations/implications – This paper is based upon the experience of one academic working within one university. 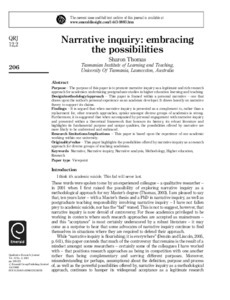 Originality/value – This paper highlights the possibilities offered by narrative inquiry as a research approach for diverse groups of teaching academics.